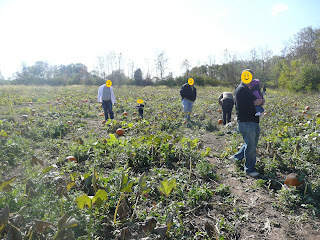 We started a tradition with some friends of ours of going pumpkin picking every year. The pumpkin patch we go to charges $0.49/pound. Even though grocery stores have great deals on pumpkins, it's a fun tradition and we make sure we go every year. The kids love it! We usually let the kids pick out one pumpkin and then we buy a huge one for $5 at the grocery store. The kids love going and hunting for their perfect pumpkin. 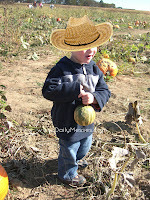 Hubby has one steadfast rule: they can only pick a pumpkin that they can carry. Of course, their idea and our idea of a great pumpkin differ. 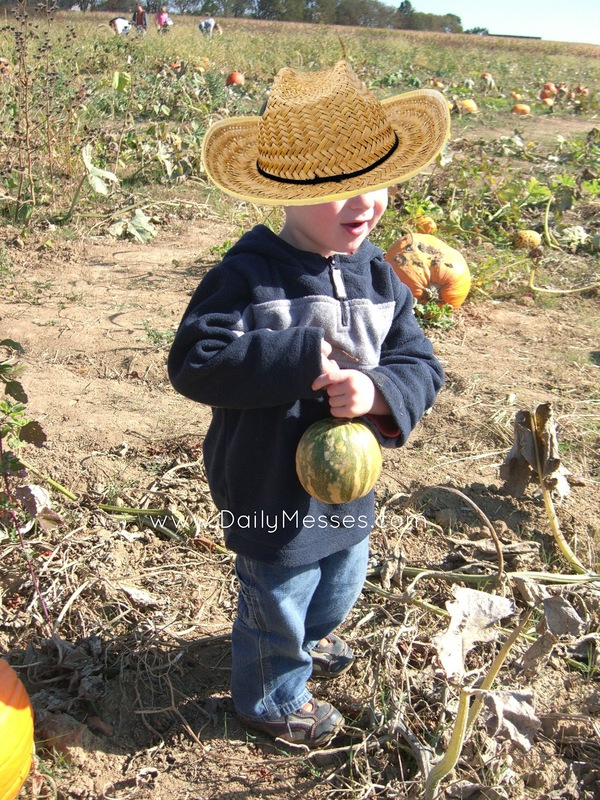 One year, Bernardo picked out a small, lopsided green pumpkin! When we're done at the pumpkin patch, we usually stop in their store. They sell apple cookies, apple donuts, apple pies, apple fritters, and apple cider. It's delicious! A friend of ours knows the owners and helps out during the Fall season. He got us in behind the scenes one year and we were able to watch the apple press make the apple cider. It was pretty cool! Most years we have a blast; however, a couple of years ago it had rained for the week before we were supposed to go. It was a mud patch more than anything. We got stuck in the mud a few times and we were definitely dirty by the time we found our pumpkin. If it's been raining before you go, make sure to dress appropriately (we learned this lesson the hard way). If you are interested in finding a pumpkin patch near you, try this website http://www.pumpkinpatchesandmore.org/index.php#states or Google "pumpkin patch" and your zip code. It's a great family tradition to start and the kids will love it! See how happy we all are!